Charles Henry Tenré grew up in the wealthy Parisian suburb of Saint-German-en-Laye. Although his formative years are largely undocumented, Tenré’s later paintings demonstrate a familiarity with comfortable bourgeois interiors that hint at a personal acquaintance with this type of environment. Saint-German-en-Laye in fact is a particularly unusual suburb—with its association with the French monarchy dating back to the medieval period, and its renaissance château at which everyone from Mozart to Benjamin Franklin seems to have stayed. In Tenré’s time, the bustling suburb was also home to the young Claude Debussy and the painter Maurice Denis. In short, it was an affluent location, conveniently linked to central Paris via rail, and replete with historical and natural amenities. Tenré’s artistic education undoubtedly began in part at the local Musée des Antiquités Nationales, which opened at the château in 1867. The Gallo-Roman antiquities would have served as classical models for the young artist, training his eye and his sensibility in the traditional French aesthetic. By the early 1880s, Tenré was already studying in Paris at the Ecole des Beaux-Arts where he studied under a variety of instructors. First was Edmond Yon who was primarily a landscape painter working in a style similar to Corot and the Barbizon painters. 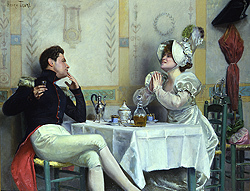 Yon had won a medal at the Salon in 1879, which may have been part of the attraction for the teenaged Tenré. His next two instructors were Gustave Boulanger and Jules Lefebvre, both of whom were classically trained in the tradition of history painting and portraiture. The 1880s were a time of great turmoil and opportunity for a young artist. Traditional French artistic venues were shifting rapidly under pressure from artists for more open-minded Salon juries as well as the growth of commercial galleries. In addition, the continuing press attention—and occasional success—received by the independent Impressionist exhibitions in the 1870s had a profound effect on how artists thought about their careers. As Parisian galleries like Georges Petit began to host exclusive opening receptions modeled on the London example of the Grosvenor Gallery, the economic locus of the art world transferred from the traditionally public Salon to the fashionably elite private viewings at commercial dealers. After the sixth Impressionist show in 1881, the French government withdrew its sponsorship of the official annual Salon exhibition. The result was the formation of Société des artistes français, with William-Adolphe Bouguereau as its first president, whose goal was now to organize the annual Salon without government assistance. It was here, in 1883, that the nineteen-year-old Tenré first began exhibiting his paintings. It also seems to have been at this time that he began to sign his paintings “Henry” Tenré rather using his full name. Not surprisingly, Tenré’s paintings reflect much of the new aesthetic sensibility filling the galleries and Salons of fin-de-siècle Paris. Although much of his work remains undated, a painting such as The Surprise seems to spring from an early moment in his career when he was mastering the art of traditional genre imagery with its sentimental narrative content and emphasis on luxuriant fabrics, colors and textures. Perhaps somewhat later is a work like Femme au toilette, in which an attractive young woman stares pensively into a small hand mirror as she assesses how much face power to apply. The rich fabrics and furnishings are now a study in pink and beige, as if borrowing from Whistler’s tone-on-tone compositions of the 1860s. Further, the narrative content has disappeared, leaving the viewer to form a personal interpretation of the painting. Like so many depictions of young women from this period, Tenré’s image may reasonably be understood as either a high-class courtesan or a respectable young woman preparing for a night at the theatre. The elegant yellow kid gloves on the dressing table and the beautifully designed Worth gown were worn equally by both groups of women. A completely different image of women emerges in Two Women in an Interior, surely from the 1890s. The women in question are not simply posing in an undefined space, but in an art studio of some sort. Seated in front of an easel, a woman in white—with an apron covering her frock—seems to wait for a comment from her colleague, dressed in black, and seated on a chair beside her. Both are rapt in their discussion of the unseen painting before them. The surrounding room is filled with paintings on the walls, sculpture tucked into unobtrusive niches, and a cabinet with art supplies in the background. Clearly, this is a serious conversation among female painters, perhaps even an image from the Académie Julian where Tenré’s instructor Lefebvre taught in addition to his duties at the Ecole des Beaux-Arts. Such openness to the changing roles of women in the late nineteenth century intimates that Tenré not only supported the “modern” woman, but also the continually evolving aesthetic experiments of this period. Many of Tenré’s paintings are relatively small in size, thus designed for the middle-class art market. His work was recognized with a commendation at the Salon of Société des Artistes Français in 1891, and again with a silver medal in 1911. In 1900, he was honored with both a bronze medal at the Exposition Universelle in Paris, and with the Legion of Honor award. Tenré was fifty years old at the advent of World War I; although nothing is recorded about these years, he was exhibiting his work again by 1921 when Le Carosse du Saint-Sacrement , a Theatrical Souvenir was shown at the Salon de la Société des artistes français in Paris. Although little evidence remains, Tenré was reported to have designed numerous theatrical sets in addition to his painting, of which this may have been a remembrance. He died in Paris in 1926.